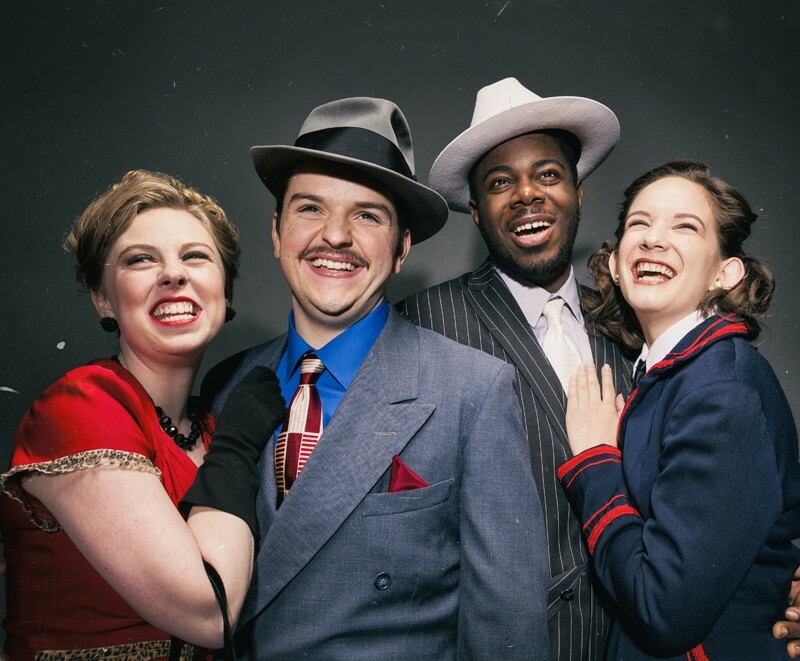 Brenda Darcy, left, Greg DeCola, Robert Edwards and Christine Skorupa star as Miss Adelaide, Nathan Detroit, Sky Masterson and Sarah Brown, respectively, in the Theatre Department's production of "Guys and Dolls." Image Credit: Marcus Newton. Brenda Darcy, left, Greg DeCola, Robert Edwards and Christine Skorupa star as Miss Adelaide, Nathan Detroit, Sky Masterson and Sarah Brown, respectively, in the Theatre Department's production of "Guys and Dolls." Photography: Marcus Newton. Christine Skorupa enjoys having the songs from “Guys and Dolls” stuck in her head at all hours of the day. “It’s at the point that if I’m having a conversation with someone who says a line from a song, I’ll snap into rehearsal mode,” she said with a laugh. Skorupa, who plays the big-hearted Sarah Brown, and her cast-mates will bring the classic 1950 musical comedy to the Watters Theater stage at 8 p.m. Nov. 9-10, 16-17 and 2 p.m. Nov. 18. (A special matinee for K-12 school groups will take place at 10 a.m. Nov. 16.) Tickets are $18, adults; $16, faculty/staff/alumni/seniors; and $10, students/children. In “Guys and Dolls,” set in a Depression-era New York City, gambler Nathan Detroit (played by Greg DeCola) makes a bet with fellow high-roller Sky Masterson (played by Robert Edwards) in the hopes of funding a venue for his craps game. Sky must take a woman of Nathan’s choosing to Havana, Cuba. It’s a bet not made any easier when Nathan chooses Sarah Brown from Broadway’s Save-A-Soul Mission. The Theatre Department’s production of “Guys and Dolls” features 24 cast members and an orchestra. The show enables each person in the cast ensemble to “build a character,” Brady said. Two of those memorable characters are Sky and Sarah. Skorupa, who starred as Dorothy in “The Wizard of Oz” musical in fall 2017, said she can relate to Sarah’s desire to help those in need. But Edwards also appreciates the evolution of the character during the show. Both Skorupa and Edwards agreed that they knew they had the chemistry for the roles after improvising a fight during the audition process. Besides chemistry development, Skorupa and Edwards are also triggering their “triple-threat” skills: singing, dancing and acting. Dancing has proven to be the most challenging talent for Edwards and Skorupa. The songs of “Guys and Dolls” are familiar to anyone who has seen the 1955 Frank Sinatra-Marlon Brando-Jean Simmons film or the numerous Broadways revivals. “A Bushel and a Peck,” “Sit Down, You’re Rocking the Boat,” “Luck Be a Lady,” “I’ve Never Been in Love Before” and “Marry the Man Today” are among the tunes that have proven everlasting. Skorupa praised Edwards’ version of “Luck” (“I love sitting in the audience and taking it in every night.”) and chose “I’ll Know” as her favorite to perform. Brady predicted that “Guys and Dolls” is a journey that audiences will enjoy, as well.